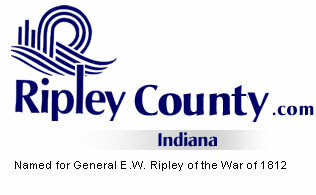 The Ripley County Council met on Tuesday, December 12th, 2006 at the Ripley County Annex in Versailles, Indiana. Donald Dunbar, Council President called the meeting to order promptly at 7:00PM with the pledge of allegiance to the flag. Council Members Don Dunbar, David Simon, Edward Armbrecht, Ben Peetz, Dephane Smith and William Dramann were present. Mark Busching was not present. Neil Comer, Attorney was not present at the council meeting. Council Member Smith made a motion to approve the minutes from the October 17, 2006 Council meeting seconded by Council Member Armbrecht. Motion approved unanimously. Additional Appropriations: Council Member Smith made a motion to approve addition appropriation of $40,000 from Fund #507-49560-000-507 RSRF Waterline Extension Grant-Johnson Twp seconded by Council member Armbrecht. Motion approved unanimously. Commissioner Reiners presented an additional appropriation for $40,000 from Fund#293-41500-000-293 Riverboat Gaming Fund to purchase ground for the Ripley County Fairgrounds from the Adams family. Reiners advised that they had appraisals done on the ground. Attorney Comer advised that he had Donald L Moeller/Lakeview Appraisal Service, Inc present an appraisal of $45,000 for the tract of land and Frank McDonough faxed an appraisal of $43,000 for the same ground. Attorney Comer advised that he had amended the Resolution of Interest in Purchasing Property Adjacent to Park (removed the price) and that this is the first step in purchasing the ground. Council member Simon made a motion to approve the Resolution of Interest in Purchasing Property Adjacent to Park seconded by Council member Smith. Motion approved unanimously. Attorney Comer advised that it was his understanding that the commissioners are still interested in purchasing the ground from the Adams family. Council President Dunbar advised that it might be better to just transfer the money instead of an additional appropriation. Council member Armbrecht made a motion to transfer $40,000 from Fund#293-19920-000-055 Paramedic to Capital/Riverboat Gaming seconded by Council member Simon. Motion approved unanimously. Councilmember Armbrecht made a motion to transfer $1,500 from Fund# 293-19920-000-055 Paramedic to Contractual Services seconded Council member Simon. Motion approved unanimously. Council member Smith made a motion to approve the transfers of Auditor McCoy/$900 from Account#100-25300-000-004 Supplies to Account# 100-11600-000-004 Clerical, Superior Court Judge Morris/$432.60 from Account#100-36800-000-022 Pauper Transcripts to Account#100-44100-000-022 Law Library, Ripley County Dog Warden Lovins $600 from Account# 100-27700-000-018 Dog Warden Supplies to Account#100-32701-000-018 Dog Warden Mileage, Ripley County Surveyor/Jeff French $55.65 from Account# 100-32800-000-008 Meetings to Account#100-25300-000-008 Office Supplies and Ripley County Veterans Service /Andrew Clark $28.00from Account# 100-25300-000-054 to Account #100-34500-000-054 Postage seconded by Council member Dramann. Motion approved unanimously. Council member Dramann made a motion to appoint Covel Mills to the Planning Commission Board for another term seconded by Council member Smith. Motion approved unanimously. Council member Armbrecht made a motion to approve the encumbrances of $85,050.79 for 2006 seconded by Council member Dramann. Motion approved unanimously. Council member Dramann made a motion to appoint Ms. Chris Fairchild to the Batesville Memorial Public Library Board (joint appointment with Franklin County) seconded by Council member Smith. Motion approved unanimously. Commissioner Reiners advised the council that the commissioners are in favor of purchasing the Halcomb property for the Industrial Park and advised Ted Spurlock/ED that he would need to start with the Council. Ted Spurlock updated the council members on the Industrial Park/Versailles, Indiana and advised that they would like to purchase the Halcomb property that is adjacent to the Industrial Park at a cost of $10,000 an acre (approximately 8 ½ / 10 acres). Council member Smith made a motion to approve the money for the cost of the (out of EDIT Budget/Economic Development) Halcomb property for the Industrial Park seconded by Council Member Armbrecht. Motion approved unanimously. Council member Smith asked Attorney Comer what his opinion was of what had been done at the budget time with the Commissioners’ EDIT budget. Attorney Comer advised the council that he felt that probably they shouldn’t have transferred money from the Bituminous & Stone to Economic Development in the EDIT fund at budget time. Council members decided after a short discussion of the Sheriff’s Contract it was decided that they would just table this and have a committee meet to go over the contract and report back to the council. President Dunbar set up a committee to go over the Sheriff’s Salary Contract for 2007. Committee was President Dunbar, Council Members Smith, Armbrecht, Commissioner Reiners, Attorney Comer and meet with Sheriff-elect Grills on Friday, December 15th, 2006 at 10:00AM. Council members recessed until 7:00 PM on Monday, December 18th, 2006. Council member Smith made a motion to recess until December 18th, 2006 @ 7:00PM seconded by Council member Simon. Motion approved unanimously. County Meeting December 18th, 2006. Council Meeting December 18, 2006 opened after recessed from December 12th, 2006. Council President Dunbar opened the recessed council meeting promptly at 7:00PM on Monday, December 18th, 2006. Council President Dunbar, Simon, Smith, Armbrecht, Peetz and Busching were in attendance. Dramann was not present. Attorney John Ertel represented County Attorney Neil Comer who was not present. President Dunbar updated the council members as to what had happened at the committee meeting that went over the Sheriff’s Contract for 2007. Council members Dunbar, Smith, Armbrecht, Commissioner President Reiners, Attorney Comer and Sheriff-elect Grills met on Friday, 15th, of December 2006 and recommended that it be budgeted next year and stay with the $56,160. Council Member Smith made a motion to stay with the recommended $56,160/ 4% raise for the Sheriff’s Salary for 2007 and bring up again in 2007 seconded by Council Member Armbrecht. Motion approved by five members (Smith, Peetz, Dunbar, Simon & Armbrecht) Council Member Busching abstained. Sheriff-elect Grills presented the council facts with his proposal for the 2007 salary and ask that they adopt the salary that they had originally adopted and allow the sheriff’s compensation to be mirrored by the 2.8 statue. Grills reported that he is willing to work with the council. Council member Simon made a motion to sign a letter of support to the Lawrenceburg Riverboat Grant Program for the grant application submitted by the Town of Osgood for funds to purchase a 64 acre tract of land on the southwest edge of Osgood for development into an industrial park seconded by Council Member Smith. Motion approved unanimously. Council member Smith made a motion to adopt the Resolution of $64,000 and the Sheriff’s Salary Contract seconded by Council member Busching. Motion approved unanimously. Clerk Ginger Bradford asked that the council members go back and go over the budgeted salaries for clerical and deputies. Bradford advised that she needs to bring her clerical up to deputies. Council Member Smith made a motion to adjourn until the next regular meeting on Tuesday, January 16th, 2007 @ 7:00PM seconded by Council member Busching. Motion approved unanimously.